Sometimes you write an article and think, this starts to get really long now! Ideally I'd split this up in multiple pages. Well, this add-on makes that easy for you. You can add blocks like you normally do. Then, at the end of each page section you add the Page Splitter block. 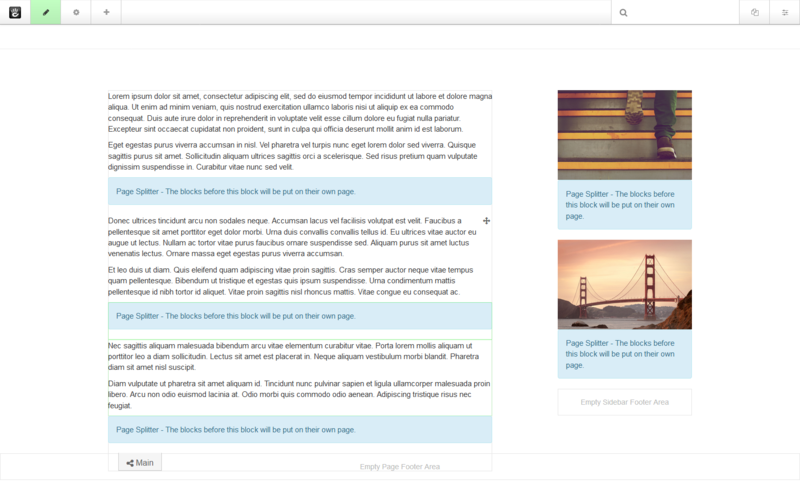 The blocks are used to indicate where content should be split, but also for pagination. When a visitor views the page, they will see a pagination to go through the pages. This is all done automatically. Technically it remains the same page. PS. Multiple paginations on one page are supported! You can even be on let's say page 4 in one pagination, and page 3 in the other. It helps you divide up lengthy content into smaller, digestible chunks of content. It gives more insights when using Google Analytics (or similar tools) and it can lower the bounce rate. It can make your website more valuable for advertisers, because you get more page visits. Page Splitter doesn't work when Full Page Caching is enabled. It's basically the same as when you show a page list block with pagination. Make sure you run concrete5 8.4.0 or higher.